In the 70s, the Formula One season wound down with a trip across the Atlantic to North America for two of the final rounds of the championship. 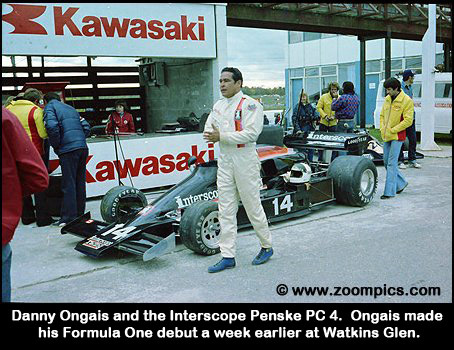 In 1977 they visited Watkins Glen on the first weekend of October for the US Grand Prix - East and a week later contested the Canadian Grand Prix at Mosport. The first Formula One race in Canada took place at Mosport in 1967 and until 1971, the event alternated annually with Le Circuit Mont-Tremblant. Mosport had become the permanent home of the Canadian Grand Prix for last six seasons. However, the Grand Prix Constructors Association boycotted the 1975 race over a contractual dispute. James Hunt won the race at Watkins Glen by a margin of 2.26-seconds driving a McLaren M26. He was followed by Mario Andretti in a Lotus 78 and Jody Scheckter driving a Wolf WR 3. Finishing fourth and securing the World Driving Championship was Niki Lauda in a Ferrari 312T. Although the driving title was settled the remaining positions in the world championship were still wide open. Heading into Mosport Andretti was second in the standings with 47 points just one more than Jody Scheckter. Andretti had cut back on his USAC Champ car activities in order to win the world title. 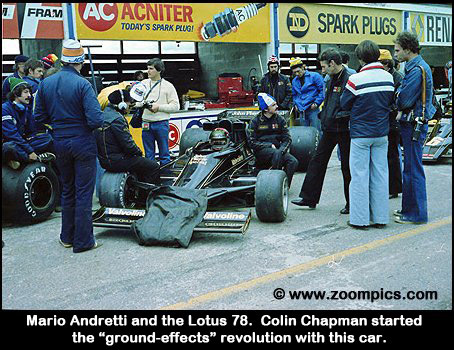 Although the Lotus had given him four wins (United States Grand Prix - West, Spain, France and Italy) it was unreliable. Scheckter's season had been similar to Andretti, however, his results could be considered much more respectable as they were accomplished with a new team. The Canadian owned Wolf team won the very first race of the season in Argentina. Unfortunately, they also suffered from a race car that prevented consistent results. Ten points behind Scheckter was the number two Ferrari driver Carlos Reutemann. Reutemann had collected points throughout the season, however, it was generally the result of lower point scoring finishes. 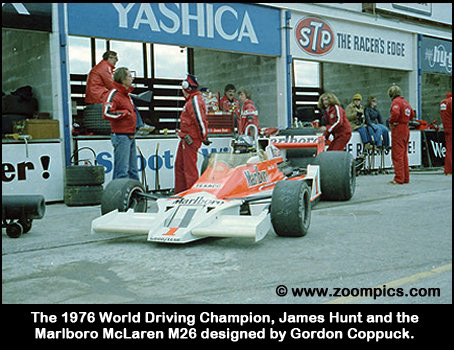 The defending world champion, James Hunt had 31-points. The McLaren M26 was extremely fast but like Andretti and Scheckter consistency prevented him from being higher in the standings. As the driving title had been settled, the Mosport event should have had less importance to Formula One enthusiasts, but there were some interesting developments between the two races. The relationship between Niki Lauda and Ferrari had been strained all season but deteriorated further after he announced that he and his mechanic, Ermanno Cuoghi would be leaving to join Brabham for the 1978 season. After hearing this news, Ferrari decided to let Cuoghi go at Watkins Glen. This incident did not improve Lauda's mood and the new World Champion decided he would not compete in the remaining races - Mosport and Japan. It was also reported that Lauda was critical of the addition of Gilles Villeneuve for the final races as he felt three cars would spread the team a little thin. 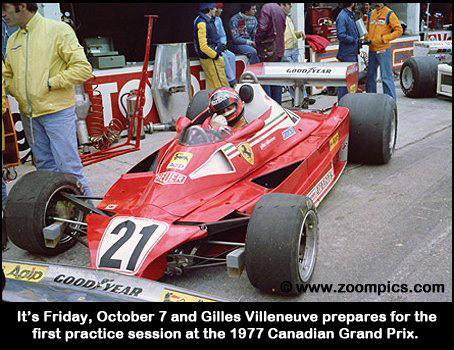 Two weeks earlier Villeneuve had signed with the team and was scheduled to make his debut at Mosport. For many Canadian fans the disappointment of not watching Lauda drive was lessened by the prospect of seeing Villeneuve compete in Formula One. Lauda's departure just provided more resources for him and teammate, Reutemann. The first practice session was highly anticipated by Canadian Grand Prix enthusiasts, as it would be their first opportunity to see Gilles Villeneuve in a Ferrari. Patriotic support was also given to the Wolf WR 3 driven by Jody Scheckter and owned by Montreal businessman Walter Wolf. Unfortunately, attention turned from the Canadian favourites to Ian Ashley who had a massive accident. Towards the end of the 90-minute session his Hesketh became light in the front end as he crested the brow on the Mario Andretti straightaway. This caused the car to become airborne and somersault three times before colliding with a television tower. It took 40-minutes to remove Ashley from the car and another half-hour before a helicopter appeared to take him to the hospital. He suffered broken ankles and wrists and a slight concussion. Later in the session, Jochen Mass hit the guardrail in corner one. Although the car was not severely damaged and Mass was unhurt the impact broke the wooden support poles. After these two incidents, drivers and teams began to question Mosport's safety. To address their concerns repairs were made to the guardrails and a helicopter was supplied for the remainder of the weekend. The Friday one-hour afternoon session was used for qualifying. Mario Andretti driving the John Player Special Lotus 78 captured the pole with a 1:11.385. In fact, Andretti turned times below James Hunt's outright lap record of 1:12.389 in the morning practice session. Hunt in the McLaren was clocked at a 1:11.942, which was good enough for second. 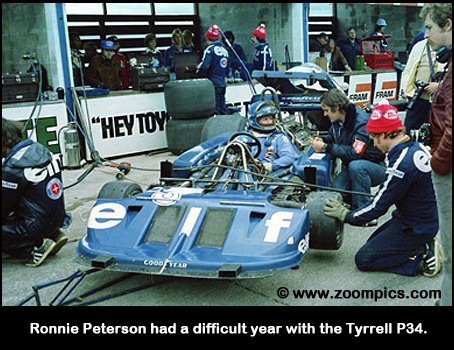 Sweden's, Ronnie Peterson set the third fastest time in the unique six-wheeled Tyrrell P34. Fourth quickest was Andretti's teammate Gunnar Nilsson. 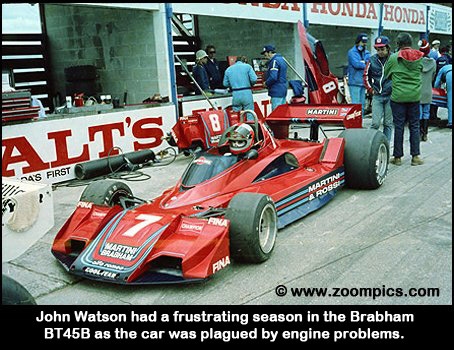 Rounding out the top ten were Peterson's teammate Patrick Depailler, the Shadow DN8 duo of Alan Jones and Riccardo Patrese, Jody Scheckter in the Canadian entry and the Brabham BT45B of John Watson. Seventeenth on the grid with a 1:14.465 was Gilles Villeneuve. 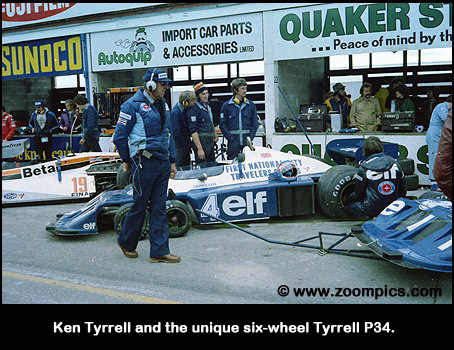 He was just over half a second slower than his teammate Reutemann. 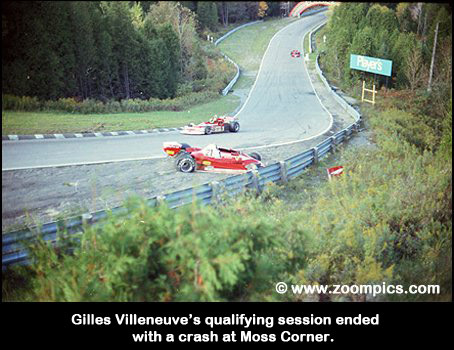 Unfortunately, Villeneuve ended his session with a crash at Moss Corner. The next opportunity to qualify would be Saturday afternoon, however, rain moved into the area and the grid was set by Friday's times. After Ian Ashley's spectacular crash 26 cars were competing for 25 starting positions. The driver impacted greatest by the weather was Jean-Pierre Jabouille, who was driving the Renault RS01. Engine problems during the first qualifying session prevented him from turning a competitive lap. It was unfortunate that this car did not compete as the turbocharged V6 Renault represented the future of Formula One. Sunday turned out to be a cold and windy day, however, a crowd of over 61,000 turned out to watch the race. Andretti made a great start and took the lead into corner one. The top ten at the end of the first lap was Andretti, Hunt, Mass, Nilsson, Patrese, Depailler, Peterson, Watson, Jones, Scheckter and Reutemann who had moved up from his twelfth starting position. Before the first lap was completed Clay Regazzoni had gone off at corner two and John Watson at turn eight. As the cars continued to circulate it became apparent that Andretti and Hunt were in a class of their own. They left Mass behind to deal with Scheckter, Depailler, Patrese and Vittorio Brambilla in a SurteesTS19. By lap 60 Andretti and Hunt had lapped every car except third place Mass. On lap 61, Andretti got two wheels off the track at Moss Corner while trying to pass Mass. This slip-up allowed Hunt to take the lead. Going into corner three on lap 62 Hunt attempted to lap his teammate and they collided knocking both cars off the track. Mass was able to continue in fourth, however, Hunt was out of the race. Although it appeared that the teammates got their signals crossed Hunt blamed the incident on Mass. After he was extricated from the car, he stood at the side of the track waving his fist at Mass for several laps. Hunt was so enraged that he punched a corner worker who attempted to move him away from the edge of the track. Race officials later fined Hunt $2,750 for his actions. Andretti now had a full lap over Scheckter in second and third place Depailler. On lap 77 of the 80-lap race Andretti's Ford Cosworth engine lost oil pressure and exploded. The race, which had been rather quiet since the departure of Hunt, was starting to get interesting again. The oil dropped by Andretti's engine failure caught several drivers off guard. Patrese, Brambilla, Danny Ongais in the Interscope Parnelli and Villeneuve all spun on the oil. Pratrese crashed into Rupert Keegan's Hesketh, which had been abandoned earlier, and Villeneuve retired on the spot with a broken halfshaft - the others were able to continue. The retirements continued in the closing stages of the race as Patrick Neve in a March 761 lost oil pressure and the McLaren M23 of Brett Lunger had an engine blow up. The rash of retirements dramatically shuffled the running order in the final laps. Scheckter now inherited the lead of a race that he thought he had no chance of winning after the Wolf WR 3 suffered a broken exhaust system. 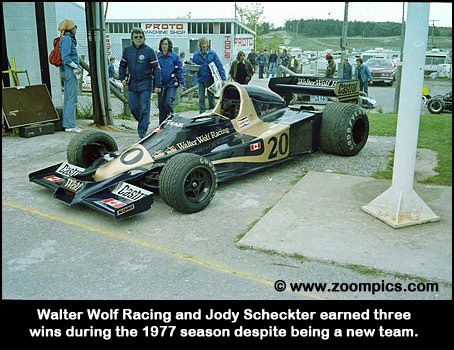 Unlike the competition the Wolf held together and Scheckter won the Canadian Grand Prix by a margin of 6.77 seconds. Joining him on the podium were Patrick Depailler and Jochen Mass. Alan Jones, Patrick Tambay is an Ensign N177 and Vittorio Brambilla took the final point scoring positions. There were only seven of the twenty-five starters still running at the end. For the Canadian fans the results were mixed. Gilles Villeneuve's race was difficult, as he had to deal with an ill-handling car. But despite his retirement, he completed enough laps to be classified in twelfth. On the other hand, Walter Wolf couldn't have had a better day. In addition to Argentina, the team had also won at Monaco. Now he could count his home race among the team's Grand Prix victories. It is interesting to note that a similar scenario played out at Long Beach where Scheckter led most of the race only to have a slowly deflating front tire rob him of a win in the closing laps. The beneficiary of his misfortune was Mario Andretti, who became the only American driver to win a U.S. Formula One Grand Prix. The season finale in Japan also included a lot of the drama, as many of the final finishing positions were determined in the latter stages of the event. James Hunt won the Japanese Grand Prix and finishing behind him in the point scoring positions were Carlos Reutemann, Patrick Depallier, Alan Jones, Jacques Laffite and Riccardo Patrese. Despite the outcomes of the final two races of the 1977 Formula One season the results only impacted two of the top five drivers in the point standings. The win in Canada allowed Jody Scheckter to take second from Andretti in the final tally. The 1977 Canadian Grand Prix was the last time that Formula One cars would compete at Mosport. The incidents during practice and qualifying highlighted how outdated the safety measures were at the legendary venue. The following year the Canadian Grand Prix found a new home at Ille Notre-Dame in Montreal.